Register and Save your recovered Emails! Congratulations! You have successfully recovered your deleted Email! 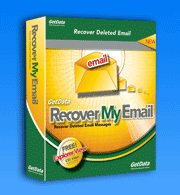 Once you have completed the other steps of the Email Recovery process, you should by now be able to preview all your recovered Outlook emails in Recover My Email. We have constant contact with our customers and thus we know that previewing the recovered emails brings enormous relief to them. Gaining your trust into our software development and your feedback is very important to us - and we make sure we deserve this trust with continuously improving our data recovery products. Below please find the description of the last step in the data recovery process of retrieving your deleted Outlook files. You must activate the program in order to save recovered messages. Click on the purchase links at www.recover-my-email.com to purchase a registration key. The activation key is delivered at the conclusion of the purchase process (or as soon as your credit card provider authorizes the transaction). The activation key is entered by clicking 'Help' in the top most program menu. Cut and paste your details into the activation fields provided. Right click on a message in the top right hand window and select 'save as .EML file'. An '.EML' file can then be saved to any location. Double click on the EML file to open it. In the 'Normal Text' view of the message preview window, highlight some text with your mouse and select copy and paste to paste the message into another application (such as a word processor). Place a green tick in the box next to the messages that you wish to save. Click the 'Save Messages' button. You will be prompted to save messages into a new '.PST' file. Use Microsoft Outlook to open this file by selecting File > Open > Outlook Data File and selecting this PST.